Why Does a Church need a Sound System? A sound system is an appliance which amplifies the audio sounds of a minister or performers so that a large gathering of people can hear the preaching or singing. Consequently, a church needs a sound system as a vehicle to effectively communicate the Gospel of Jesus Christ to an audience. When properly installed and operated, a sound system is a subtle device which should not draw attention to itself. Within its technical abilities, it is intended to capture a live presentation and pleasantly amplify it with high fidelity without restricting a performers concentration or expression. A sound system has legitimate purpose only when it effectively serves both the performer and the audience. It is not there to be served, but to be a servant. Whenever a sound system or its operation impairs the performance of a minister, or hinders the listening of a congregation, it has lost its reason for existing. The sound operator must be acutely aware of this fact and be sensitive to the needs of both. Feedback, unbalanced mixes, volume levels too high or low, or monitors which cannot be heard by the performers are some of the common problems with a system which can literally ruin the atmosphere of a service or the composure of a minister or singers. Ive seen times where the minister and congregation were more tempted to strangle the sound operator, than in appreciating the sermon or presentation of a service. This certainly is not serving the intended purpose of a sound system and does not bring glory to God. Operation of the sound system is a serious ministry and the person who works with the sound must take it seriously. The sound operator should be a dependable person who has a servants heart, willing to cooperate and take directions, not touchy or easily offended. He should be a person with a good ear, attention span, and instinctives in working with sound mixing. He should be well trained and knowledgeable with the overall sound operation, as well as familiar with its technical abilities and limitations. Operation of the sound system has to be rehearsed, just as singers and musicians do. The operator should be present for all rehearsals of the choir, orchestra, drama group, or similar events. He should make a chart of channel volumes and adjustments which sound best in rehearsals so that they can be easily duplicated during a performance. If there is no formal rehearsal for a vocalist or preacher, a sound-check must always be conducted sometime prior to a service, in which all mics and equipment are tested, and all sound levels are adjusted and verified. Excessive guesswork and flying by the seat of your pants during the service can produce many embarrassing errors which can devastate the sensitive mood of a congregation or hinder their reception of ministry. As it seems to be in most other aspects of a church, there is a diversity of opinions about how the sound system should be operated. You will discover that when the volume level is satisfactory for most, there will still be some who cannot hear well and others who will think its too loud. Unfortunately, a sound operator cannot always accommodate every hearing sensitivity. All he can do is try to gauge the volume to an acceptable level for the average listener. A sound operator should have a few selected spotters in the audience that can help him gauge volume levels from different locations, but he should avoid being manipulated by the numerous diverse opinions. A decibel meter is helpful in gauging volume in a auditorium. But even though the volume levels may be set identically during each service, the perception of loudness will be affected by the quantity and seating assignments of the persons in attendance. The presence of each person has an effect on the acoustic environment. A larger crowd will require more volume  a smaller attendance will require less volume. It is best that only one person, such as one of the ministers or church elders, be authorized to direct or overrule the sound operators judgment for the auditorium volume. There should be some way to speak to the operator directly by intercom or headsets. The performers obviously should direct the levels of the stage monitors according to their individual preference. An established system of hand signals is generally the best method of communication between the person on stage and the sound operator. Frequently, demands are placed on a sound system which cannot always be delivered. All sound systems have their particular limitations. A sound operator should be able to know and define them to performers and congregation, and should be able to give advice how to maximize their performance with a given system. Consequently, it would be helpful for people to also be willing to try to understand the limitations of a system and accept that an operator cannot always perform miracles. The sound operator is often the target of undeserved criticism because of the limitations of what he has to work with. Because of prohibitive costs, it is rare to find a church which has the highest quality microphones and audio equipment, and most churches are notorious for building designs which produce poor acoustics. Complicated by volunteer personnel which usually have little or no training with audio technology, it is easy to realize why churches often complain about their sound. People who are accustomed to the professionally mixed sounds of records, tapes and video expect the same results in their church. But this high quality can only be achieved with: (1) Properly installed, high quality microphones and audio equipment, (2) a favorable acoustic environment, and (3) knowledgeable and experienced technical operation of the sound system. Sound systems can be very basic, consisting of just a mic, amp/mixer, and speakers. But for larger applications, a sound system can be fairly complex. 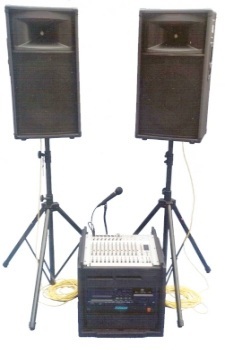 Some systems may have a variety of different microphones for different applications, including a multi-channeled stereo mixer board with an ensemble of speaker consoles. Such systems might be reinforced with components for equalization, compression/limiting, audio distribution mixing and splitting, digital delay, reverb, phantom power supply, tape recording equipment and isolated mixers for fold-back/monitor speakers or other sound applications. When a church has a simple system which delivers sound only toward the congregation, I refer to this as a single phase system. However, a system which also includes separately controlled stage monitor speakers (also called fold-back speakers) for performers to hear themselves, would be considered a two phase system. The best way to understand a two phase system is to think of it as two separate sound systems. A public address system for the audience, and a stage monitor system for the performers. Each system receives identical input from the same set of microphones, but each can mix a different volume balance on each channel and send to its own set of speakers. The purpose of a monitor system is to help the person on the stage. Singers and performers need to hear themselves in order to blend together, and they often need a different sound mix than what would generally sound pleasant and blended to the audience. For example, a singer using recorded music tracks to accompany himself could have the sound for the monitor mixed so that his voice is heard louder than the music track, if so desired. This would have no affect on the sound directed toward the audience, which would be mixed by separate controls to cause the music and vocals to blend together evenly. Monitors are essential in larger churches, or especially when a performer cannot adequately hear his own sound coming over the PA to the congregation. For more extensive applications, there also can be three phase systems which can add an additional closed circuit for independently mixing sounds for broadcasting or recording purposes. This is thought of as a third, isolated system in which sounds from the same microphones are mixed differently for another type of application. The reason for this is, while the audio heard by the audience may sound well blended, it will not always sound correctly mixed when listening through headphones or on a tape recording. There is a difference between ambient sound which is affected by acoustic conditions, and closed circuit sound, which is pure audio signals without the bias of acoustics. In an auditorium, the ear hears sounds from PA speakers over a distance after the sound has reflected off walls and shaped objects. These acoustic conditions change the nature of frequencies, tonal quality, and perceived volume values and blends. So what may sound good to the natural ear, may sound terrible on a recording or when broadcast over the radio. One of the most common problems in a church is the positioning of the audio control/mixer board. For the sake of security or visual aesthetics, control equipment might be installed in a remote booth in the rear, perhaps with an openable window for the operator to hear. Headphones are often used as the only method to gauge the balances between microphones. However, this almost always proves to be a disaster as the sound operator cannot accurately hear the acoustic balance of the sound he is trying to control. The sound controls and operator must be placed where he can hear the same acoustic environment that the congregation hears. A open air, box-seat enclosure equipped with sound mixer, in the approximate center of an auditorium or balcony is usually the most effective format. Feedback is technically known as audio oscillation. In simple terms, it is nothing more than sound coming out of the speakers, going back into the microphones and reamplified in rapid oscillating cycles, creating a shrill whine or squeal. The object of a system is to achieve satisfactory, high fidelity amplification of sound before feedback occurs. Under some circumstances, limited by acoustics and poor equipment, this can be a real challenge. 1. Turn the volume down. 2. Decrease gain on equalizer (EQ) or tone controls. 3. Reduce monitor system volume or its EQ gain. 4. Move microphones farther away from sound path of speakers. 6. Use higher quality, low impedance microphones and equipment. 7. Select tighter patterned, cardioid microphones when possible. 8. Decrease gain on reverb controls. 9. Improve room acoustics to absorb more reflected sounds. 10. Have an audio engineer to perform an acoustic analysis between your system and auditorium using a pink noise generator and oscilloscope. By this method, he can identify feedback prone frequencies and help you tune your graphic equalizer or suggest acoustic alterations to your auditorium. Radio frequency interference (RFI) can bleed into sound systems from nearby radio stations, or C.B. radio transmitters. Electro-magnetic frequency (EMF) interference can also come from other electrical devices such as electrical transformers, fluorescent lights, computers, electric motors, or switches. High impedance microphones and equipment are much more sensitive to these types of interference. In some cases, interference in such systems can be reduced by using shielded microphone and input cables, and reducing their lengths. If possible, the best solution is to convert to low impedance, balanced mics and equipment, making certain that all mic and input cables and connections are well shielded. Low impedance systems are more resistant to interference. If interference is detected, its often due to some defect in a shielded cable or connection somewhere in the input side of the system which can be traced and repaired. Grounding problems can be another common cause for PA interference. If your control board and amps are equipped with a three pronged, grounded AC plug, make sure that the electrical outlet is properly wired with a good ground connection. If electrical buzz still occurs, some amps or mixer boards have polarity switches that can be reversed, which by experimentation may help reduce or eliminate some electrical noise. If problems persist, consider that the problem may originate in one of the components in your system. Remove individual components (such as equalizer, limiter, etc.) one at a time, and see if their removal eliminates the problem. If no success, try temporarily lifting the ground at the electrical source to see if the buzz disappears. If so, this will usually confirm that it is a grounding problem somewhere in the system. Removing the ground to a system or certain devices is a common method that some technicians use to eliminate grounding buzzes, but it is dangerous and not recommended to leave a system ungrounded. A ground is there for human safety, to provide shut-down of an electrical circuit in the event that live voltage comes in contact with the chassis or a user handled area. Even though most audio equipment will be powered by 110 volts, this is more than enough to kill a human being under the right circumstances. For this reason, all sound operators or technicians should always wear rubber-soled shoes. For temporary testing purposes, a ground fault interrupter (GFI) can be substituted in absence of a ground, which can provide an operator some limited protection from electric shock. But the advisable method of dealing with grounding problems is to have an electrician seek out and eliminate any possible floating ground or ground loop in your electrical source. When possible, have an isolated dedicated ground installed to the outlets which supply power to all PA related equipment. All inter-related audio devices such as tape recorders, film projectors, VCRs or TV broadcast equipment must share the same common ground. Obviously, there may be times that you experience a problem that only can be remedied by a trained technician. But these suggestions may help in many situations, and hopefully, save you time and money for the Lords work. This article (VL-503) is copyrighted © by Dr. Dale A. Robbins, 1990-2019 and is a publication of Victorious Publications, Grass Valley, CA - Nashville, TN. Unless otherwise stated, all scripture references were taken from The New King James Bible, © Thomas Nelson Inc., 1982. You may download this article for personal use as long as you retain credit to the author. Obtain permission before reproducing copies for any reason, by filling out our simple use permission form. Many of our writings are also available as free pdf tri-fold pamphlets, which can be downloaded for reproduction from our Online Catalog. For media reproduction rights, or to obtain quantities of this title in other formats, email us. If you have appreciated these online materials, help us reach the world with the Gospel by considering a monthly or one-time tax-deductable donation.